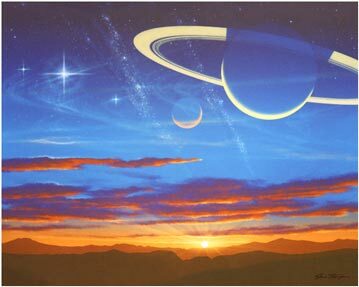 How remarkable the open sky must seem near a planet with its rings reaching out in a perspective that suggests an enormous size. The familiar earth-like sunset might be some very distant habitable planet far beyond our galaxy. What we may someday encounter, or the eyes of other remote civilizations on other worlds may now behold, is just a reassuring reminder that we are not alone in the universe. Surely not every world is too alien or strange for us to relate to. The pioneer days of the Old West must have been at times as vast, lonely and inspiring in beauty and grandeur as what we see here. Looking up into an alien evening sky might be an awesome experience on strange and beautiful worlds that we can now only imagine. To ponder the proximity of nearby stars, galaxies, nebulas, moons and planets, grouped into beautiful and strange panoramas, suggest terrain and skies that evoke the deepest, most profound thoughts and inspirations.